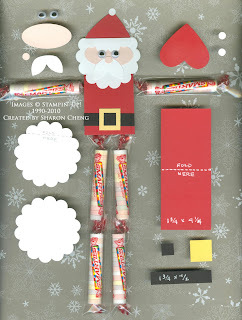 This Skinny Santa punch art treat holder is so popular that I've had several requests for a tutorial on how to make this Santa. Here is a quick list of the parts you need. Cut one piece that is 1 3/4 x 4 1/4"
Cut one piece that is 3/4 x 3/4"
Cut one piece that is 1 3/4 x 1/2"
Cut one piece that is 1/2 x 1/2"
Candy to fill the bags. I used Smarties, but other small candies will work. Fill the bags with candy. 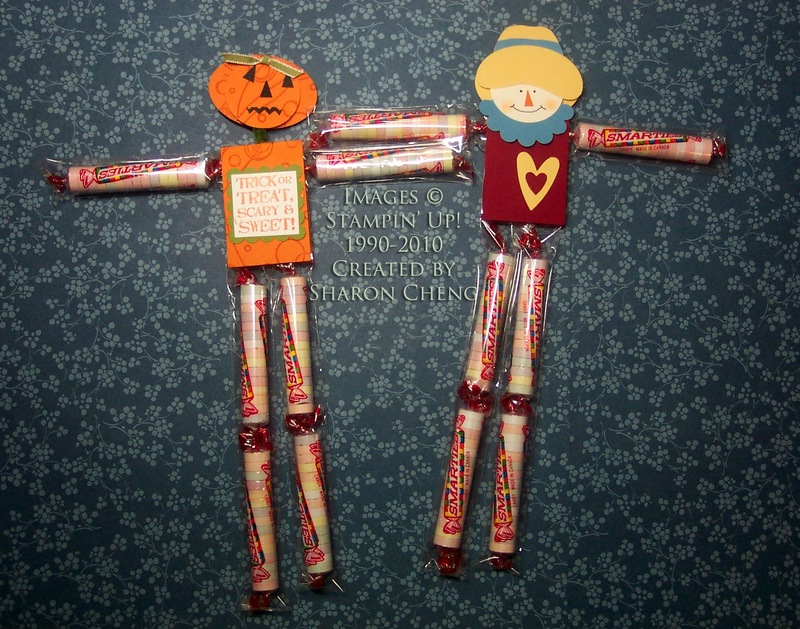 For the legs, the candy goes to the bottom of the bag. Leave an empty section at the top to attach to the Santa body. For the arms, the candy is at the top and bottom of the bag with an empty space in the middle to attach to the Santa body. Fold the 1 3/4 x 4 1/4" piece of Real Red card stock in half to form the body. The small square of black goes inside the Daffodil Delight square to form the buckle. Attach the belt and buckle. Attach the skinny bags to form the rest of the body. You may find it easier to attach the bags with Sticky Strip or Mini Glue Dots. Score and fold one of the scallop circles so that 4 of the scallops fold over to form the brim of Santa's hat. Cut two of the petals from the 5-petal flower punch to form Santa's beard. Assemble the rest of the face using the large oval, googly eyes, 1/4" circle for the nose. Attach the full heart upside down to form the top of Santa's hat. Add the 1/4" Whisper White circles to the front and back of the top of the hat. Attach Santa's face to the front of the body. Add the last scallop circle to the back of the body. You'll line this up with the scallop circle on the front. You'll have to trim off a little of the circle where it shows behind Santa's hat. Enjoy making your Santas. I've used this same idea to make a Pumpkin Man and Scarecrow. Thank you for this tutorial. I just posted on my blog with a link back to you.